Nothing To Do In Lagos? Art x Lagos Is A Place To Be! Lagos is like a beehive of activity! There is never a day or a weekend to sway by without any important function. The activities could go from alluring wedding receptions to of sounds of music blaring from a local restaurants. The activities in Lagos could be a whole day affair if your time of course isn’t programmed. Art & Lagos festival which commenced on the 3rd of this month and ends on the 5th, has been a coven for lovers of art, culture and social life. Art cannot be underestimated by bringing people from all walks of life to celebrate talent, vision, and expression of individuals. Installation view of Olumide Onadipe’s sculptural work made from recycled plastic bags. This year’s edition has been phenomenal! The 2017 edition of ART X Lagos will include exhibiting galleries and artists, special curated projects, a programme of talks, the ART X Prize, and a music show – ART X Live! The 13 Exhibiting Galleries at the 2017 edition include: Art House – The Space (Nigeria), Bloom Art (Nigeria), Fondation Donwahi (Ivory Coast), Gallery 1957 (Ghana), Galerie Atiss (Senegal), Gallery MAM (Cameroon), Nubuke Foundation (Ghana), Retro Africa (Nigeria), Signature Beyond (Nigeria), SMO Contemporary (Nigeria), Stevenson Gallery (South Africa), TAFETA (United Kingdom), and Tiwani Contemporary (United Kingdom). These prestigious galleries were chosen by a Selection Committee, led by N’Goné Fall, the renowned Senegalese curator, art critic and cultural consultant, and Femi Lijadu, one of Nigeria’s most respected art collectors. (Vanguard Nigeria). Still at the prestigious Civic Centre, the exhibiton is open to the public from now till tomorrow. The specific time for public viewing tomorrow is 11am, talks or seminars by 3pm and shut down period by 8pm. It can never be a dull moment in an art house, there will be lots of talents revealed, long conversations to be held,meeting new people and watch how art connects people from diverse ethnicity, language and community. Queen Nwaneri doing a live painting. 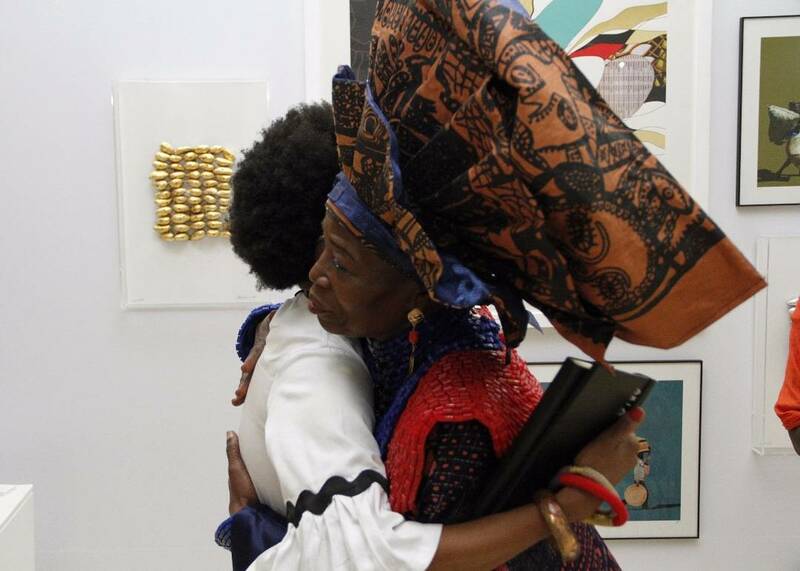 Chief Nike Davies- Okundaye giving a warm embrace to a woman. There’s a whole lot of other activities for lovers of art, good company and long conversations as the Civic Centre is divided into segments or booths. Still bored about what to do in Lagos? ArtartxlagosBoris NeboChief Nike Davies-Okundayecontemporary artEku EdeworEunice OmolehistoryLakin OgunbawoOlumide OnadipeSanusi Lamido Sanusitraffic jam artVickie O.
Kamdora Kitchen: How To Make A Homemade Tiger Nut, Coconut & Dates Milk! Fashion 101:Tips On How To Dress Up For An Art Exhibition!